Premature babies often spend the first several weeks of life in neonatal intensive care units (NICUs), where, ideally, they are protected from too much noise stimulation. However, researchers at Washington University School of Medicine in St. Louis have found that preemies may be exposed to noise levels higher than those deemed safe by the American Academy of Pediatrics. 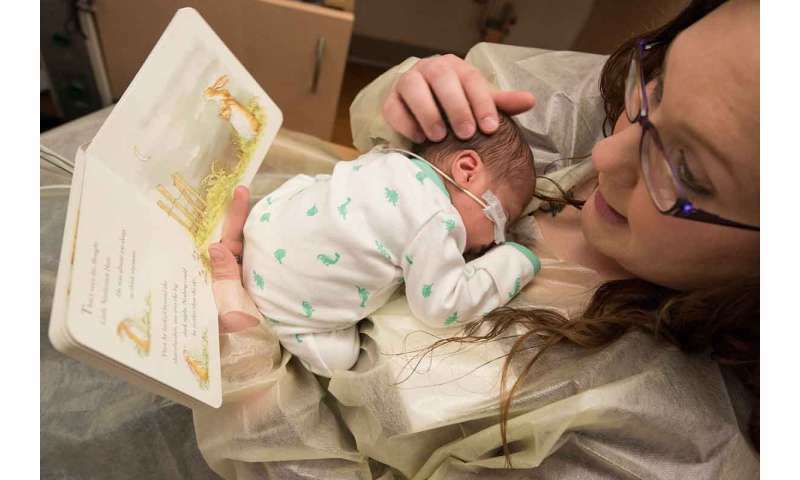 Conversely, the researchers also found that some preemies may not get enough exposure to beneficial sounds, such as language and music, that can improve early development. The researchers found that in private rooms, which are more and more common in the NICU, babies encounter much longer periods of silence than in areas of the unit where multiple cribs are in the same room. They also learned that many of the sounds in the NICU are mechanical in nature and very different from the beneficial sounds of a human voice. The study is published Feb. 8 in The Journal of Pediatrics. "We know that some exposure to sound—even among preemies—can be beneficial," said first author Bobbi Pineda, PhD, an assistant professor of occupational therapy and of pediatrics. "But sounds don't occur alone. When parents talk to their newborns, they often also hold and caress their babies—all things that help promote healthy development." Working with Bradley L Schlaggar, MD, PhD, the A. Ernest and Jane G. Stein Professor of Neurology and director of the Division of Pediatric and Developmental Neurology, Pineda's team focused on sound because her previous research indicated that, compared with children in open hospital wards, babies in private rooms in the NICU had poorer language development at age 2. Many things can influence a premature baby's language development, but Pineda and her colleagues believe that private NICU rooms can be too quiet, especially when parents are unable to visit and engage in their babies' care. They used digital language-processing devices to capture all of the sounds in the preemies' environments. The devices were hung at the bedsides of 58 premature infants in the NICU at St. Louis Children's Hospital—33 whose cribs were in an open ward and 25 in private rooms. The devices were placed near the infants' heads to capture sounds to which babies were exposed. All of the babies were born at 28 weeks of gestation or earlier, and the recordings were gathered within two weeks of each preemie's birth; again at 30 weeks; at 34 weeks; and then at about 40 weeks, when babies are considered full-term. The researchers found that the average noise level in the NICU was just under 59 decibels, with peak noise levels reaching almost 87 decibels. The American Academy of Pediatrics recommends avoiding levels above 45 decibels. But Pineda explained that can be difficult. "Often the noise we measured was coming from medical equipment that is essential to the baby's survival," she said. "And this type of equipment is used in NICU units around the world." Pineda said that the decibel levels of equipment alarms in NICUs have been reduced in recent years. The alarms alert nurses when a baby needs attention, but the alarms aren't as loud as previous models, and some even play a lullaby to get a nurse's attention. "Ventilators, however, make a lot of noise and are essential for some preemies with breathing problems," she said. "A ventilator is a necessary, life-saving intervention, but it creates a lot of non-natural noise during a critical period for the development of the auditory system." Pineda's team also found that as preemies in the study approached the dates at which they were supposed to have been born, the noises they encountered often decreased, which could be explained by the fact that many don't need as much assistance from machines and other medical equipment at that point. Language exposure also increased over time, but Pineda called it a matter of concern that there was, in general, very little exposure to meaningful language, only 30-35 minutes during a 16-hour period. The researchers also noted that babies in private rooms tended to be exposed to more silence. During the 16-hour periods that were measured, babies in private rooms experienced, on average, almost two more hours of silence. The researchers have launched a pilot study to evaluate sounds and other stimulation that might help premature babies flourish as they struggle through their first several weeks of life outside the womb. The intervention focuses on engaging parents in providing appropriate sensory exposures for their infants because the involvement of parents can be a powerful aid to healthy development. The newly published study also found that, for example, babies were exposed to more language when their parents were present, suggesting that parents can have a big impact on the environment in the NICU and, as a result, on their infants while they are hospitalized in the NICU. "However, the interventions for each infant will be different based on what medical complications are present, as well as how immature the infant might be," she said. "If a baby is born 2 ½ months before his or her due date, for example, we may recommend skin-to-skin contact and talking to the baby. As an infant approaches what is considered full-term, the baby also might benefit from movement and rocking, and being held for longer periods in addition to being read to, talked to, and hearing music and other sounds. By teaching parents to do these things, they not only provide stimulation for the infant, they also establish a better relationship with their baby. We believe that also may translate into better development in the long term." Pineda said the next step for her research team will be to assess the effects of sensory interactions—delivered by parents—to their premature babies. More information: Pineda R, Durant P, Mathur A, Inder T, Wallendorf M, Schlaggar BL. Auditory exposure in the neonatal intensive care unit: room type and other predictors. The Journal of Pediatrics. published online Feb. 8, 2017.